Here at High Performance Services LLC we use a commercial steam machine to remove ice dams from roofs, unlike other companies that use hammers, ice picks and even high pressure machines, a lot of which can easily damage a roof in the frigid temps. A commercial steam machine will not cause damage to the roofing material the way other methods will. Our commercial steam machines also mean you won’t pay for needless hours of work. Our steam machine melts ice far quicker than the average hot-water pressure washers that most so-called ice dam “experts” use to soak your roof with dangerous amounts of water. Can't I just remove the icicles? Ice dams occur when the heat from your home/business escapes to the roof where it melts the snow and as the water runs down the roof it re-freezes on the roof edge, as this happens the ice will continue to build up to the point where the water will eventually find its way into the home/business. 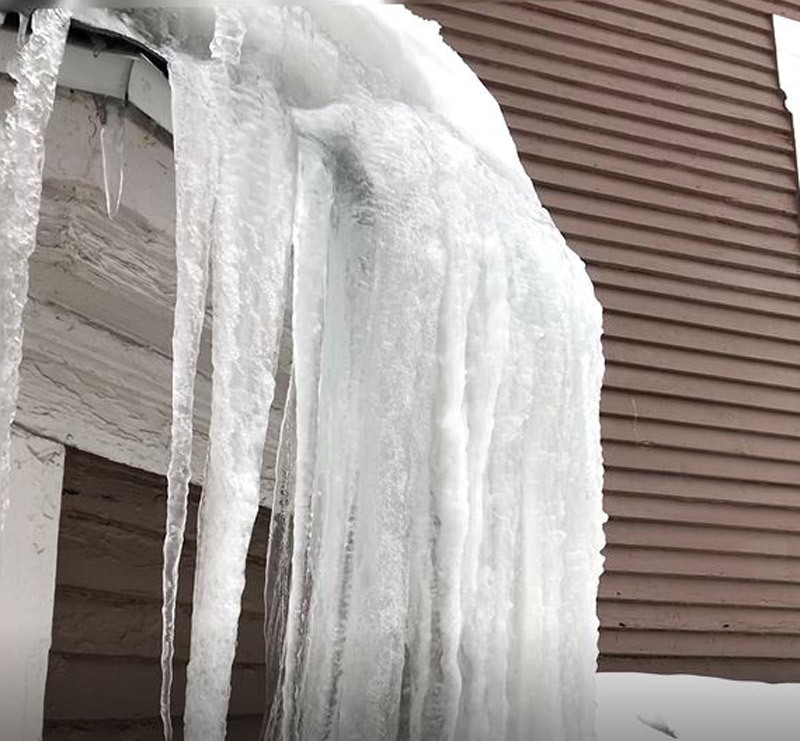 Our proven ice dam steam machine and snow removal services throughout Western & Northern Michigan can provide your home with protection from costly water damage caused by ice dams and roof leaks. Can’t I just remove the icicles? 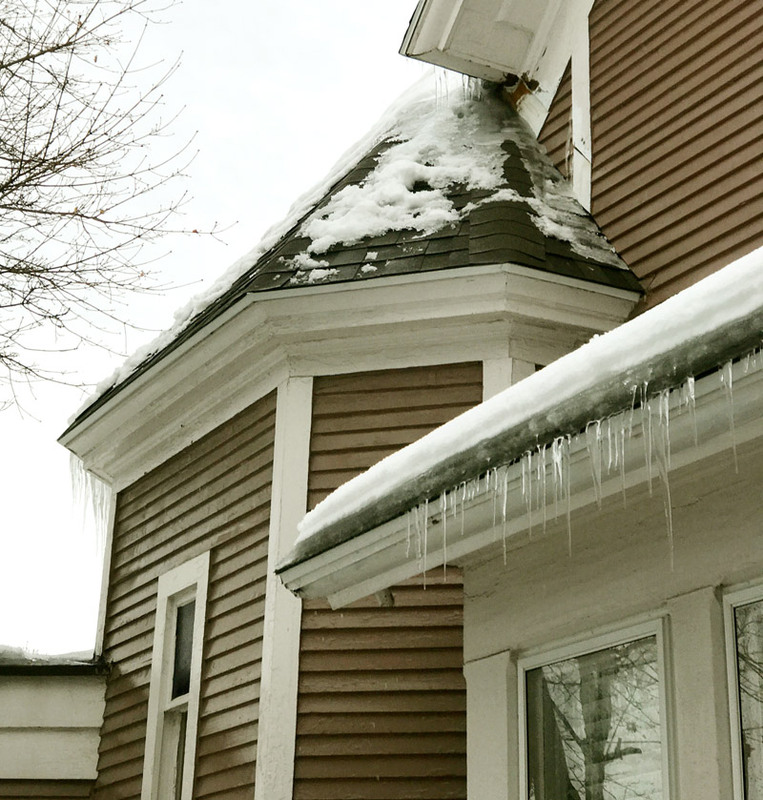 Just removing icicles from the edge of your roof will not solve the problems created by ice dams. We utilize professional grade steaming machines that ensure that the snow and ice dams are removed correctly and safely. How long does an ice dam removal take? 2 -4 hours on average, but each and every job is different and that makes in nearly impossible to determine exactly how long a job will take. This is why we don’t give quotes over the phone, if a company tells you over the phone that they can remove the ice dam in a set number of hours there is a good chance that one of the following things will happen. They won’t finish on time and then will charge more to finish the job. They will cut corners to get the job done in the stated time frame, possibly damaging your roofing material in the process. We offer same-day service. We’re there when you need us, especially if you consider it an emergency. Do you have ice dams on your roof? Is your roof leaking yet? End your leaks with a simple phone call. If you want the ice dams removed today, High Performance Services LLC can help. We’re open 6 am to 11 pm, 7 days a week, always ready for your call. We look forward to making your home free of ice dams, leak-free, safe, and comfortable. P.S. Our schedule fills up fast. If you have an ice dam, chances are hundreds of other West Michigan homeowners also have ice dams. We have a 2 hour minimum charge; the reason for this is that there are many little steps involved before we can even start the steam removal of your ice dam. Get the steam machine ready for use; access a water spigot, set up ladders, clear snow from area. Not to mention fighting Mother Nature and freezing temps the whole time. We happily provide our services in all major areas of Western Michigan including: Grand Rapids, Cascade, Ada, East Grand Rapids, Lowell, Walker, Kalamazoo, Grand Haven, Holland, Muskegon, Saugatuck, Douglas, South Haven, Pentwater, Ludington, Traverse City and all surrounding areas.